All over the Philippines, businesses that want to cater to adventure and thrill seekers have built their own versions of ziplines. A number of them are tucked in jungle canopies to give the experience a frontier appeal. 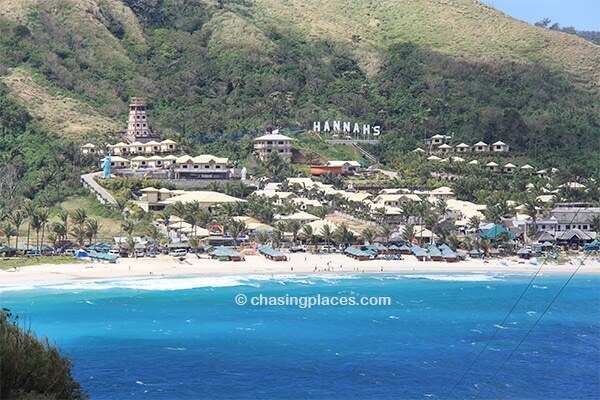 But Hannah’s Beach Resort and Convention Center in Pagudpud, Ilocos Norte is offering something different. Instead of a lush tree-covered environment, Hannah Ziplines has selected a backdrop over an absolutely stunning seascape called Blue Lagoon. 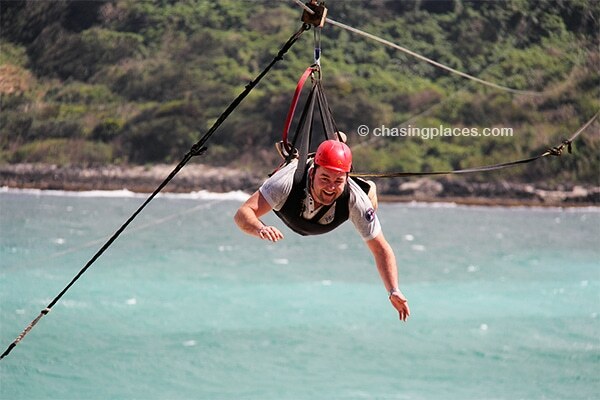 When we had a tricycle (local transport) bring us to the Blue Lagoon, we were unaware that the zipline even existed. But its designated starting point – which is a tall tower on a hill road, was actually the first thing we saw before we drove down to Blue Lagoon. 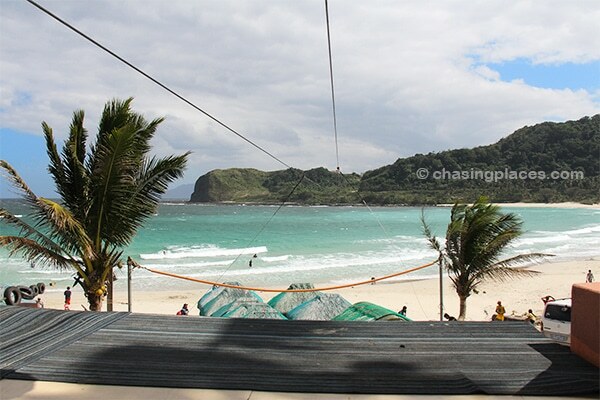 I remember being so impressed with the length of the zipline, which is connected to the tower and extends all the way to the beach resort that faces the cove. True enough, Hannah’s Resort is eagerly marketing their 1.15 km zipline as the longest one in all of Asia. I have to admit that I had no initial desire to do any ziplining that day. Although I was thoroughly impressed with the area the zipline covered, the idea of gliding over the overwhelming vast sea was a scary thought for me. It also didn’t help that I have a prevailing fear of heights that I was trying to conceal in front of my two more dauntless male companions. When we reached the resort, they eagerly inquired about the adrenaline-pumping ride. The information and ticketing desk for the zipline is conveniently located at the resort’s reception counter. This space is housed in the first building to the right side of the main entrance gate to the resort. This setup is not really a good move on the part of management, as they may have to constantly deal with a huge number of guests and walk-ins wanting different things. But fortunately, we arrived at a not so busy time and only a few people were waiting to be served. 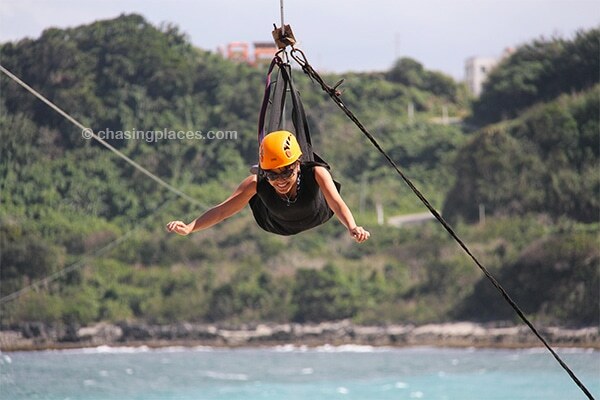 Guests of the resort have the privilege to experience ziplining to the tune of 600 pesos. Walk-in participants like us needed to pay 700 pesos for the same experience. But there’s another catch. The management actually offers two zipline positions. The first one was the standard sitting position. The other one was the “Superman position.” This means that you will have to lie down on your stomach which requires the support of a bigger harness. This position is supposed to give the illusion that you’re flying horizontally in the air, just like Superman in the movies. But choosing this position equates to paying more. I don’t know if there is a practical reason why the resort decided to charge more for the superman position. I did not really see any, except for the fact that the position is obviously more thrilling and exciting. As expected, my adventurous companions opted to go for the Superman. After making this obvious decision, they also decided to pay by credit card instead of cash. After their payment, the staff provided receipts and number stubs, which my companions were asked to give to the assistants at the starting point tower. The staff then led them to a nearby booth where the zipline equipment was located. Here, they gave out helmets and helped them don their designated harnesses. The staff members usually wait for a certain number of people to sign up before they usher them into a big van. The van then drives the people up the hilly road to the starting tower. While my companions were on their way, I climbed up to a smaller tower where the zipline terminates. Armed with two cameras, I was trying to get the right position and angle to get the perfect videos and photos of my companions’ gliding and descent. After ziplining over the shimmering waters of the Blue Lagoon, my travel companions described the experience as absolutely incredible. The adrenaline rush was not enough for them. They had to persuade me to do it too. After much discussion, these relentless individuals managed to convince me that it was the perfect day to overcome my fear. In the words of my seemingly wise friend, “You will really regret not doing this.” And these were the magic words. I finally agreed, and of course I had to do the “Superman” too. These were just some of the words that crossed my mind. Unfortunately, the bill was paid and there was no turning back. And so I found myself gliding over Blue Lagoon shortly after. The ride only lasted for mere seconds, but I, up to this day, struggle to accurately describe the experience. It was so surreal, like a dream. At the beginning, I couldn’t enjoy the adrenaline rush because of fear. But later on, the seascape below just captivated me. I remember thinking that birds are so lucky to marvel at this beauty every day. The zipline landing was quite rough because a mechanism had to break my forward momentum. When I got out of my harness, my friends were already smiling smugly at me. They both knew that I enjoyed every second of it. To prevent them from uttering the “I told you so” line, I calmly said that the ride was great, and played it cool. We spent the rest of our time at Blue Lagoon relaxing on the beach, and enjoying a bottle of San Miguel. I conquered my fear that day, and I felt invincible! How to find the cheapest rooms in the Philippines? As you get more remote in the Northern Philippines it’s probably best to use a large room provider such as Agoda.com or www.hotelscombined.com. Smaller sites just simply won’t offer the selection that most tourists need when it comes to strategically booking their rooms. Agoda.com is the largest booking site in the Philippines and we book through their site extensively. Hotelscombined is another site that we use all the time. It has saved us serious cash in the Philippines because we can compare prices before booking. Either one of these sites should be a good place to start your search for room deals in the Philippines. Your smile says it all!!! I'm surprised that there is not a trail of brown in the air!